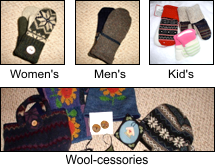 How about a hat and mitten set that is 100% wool, and contains all the colors of autumn? Here it is! I love this set. Orange, gold, brown, black, gray and red all in one pair of mittens and hat make this set very versatile. They are oth lined with high quality fleece. The hat fits an average head size of 22"-23" and the mittens are a Women's Regular Size.